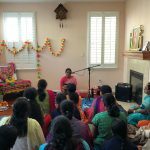 By the immense grace of Sri Swamiji, special house satsangs were held in San Ramon led by Sri.Gayathriji. 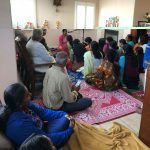 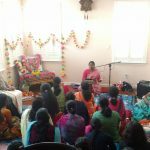 Beautiful satsang was held on Tuesday, December 18th 2017 at the residence of Smt.Meena Kannapan from 9:30am to noon. 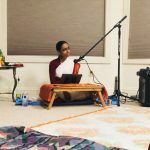 Sri Gayathriji delivered a beautiful lecture on Lord Sri Hari’s incarnations and explained in detail the incarnation of Lord Krishna as a complete avatar as told from Srimad Bhagavatam. 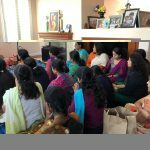 The lecture concluded with the exposition on significance of Nama. 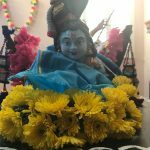 Following the discourse, the divine descent of Lord Krishna was celebrated in the form of Nandotsav where all satsang members circumambulated little Krishna to the tunes of Madhuragitam. 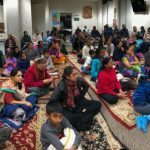 Everyone enjoyed the discourse and Nandotsav celebrations and close to 40 members attended the satsang. 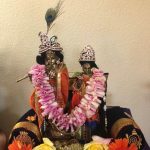 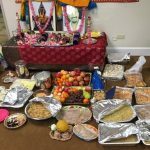 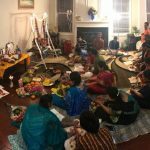 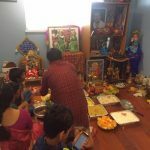 On Thursday, December 21st 2017, Govinda Pattabhishekam special celebration satsang was held at the residence of Smt.Preetha in San Ramon. 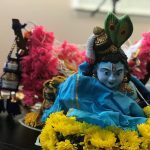 Govinda Pattabhishekam parayanam from Srimad Bhagavatam interspersed with meaning of the chapters followed by Annakootothsavam to the tunes of Madhuragitam glorifying the divine name ‘Govinda’ were the main events as part of the celebration.